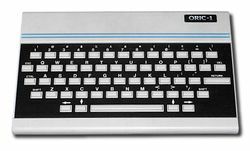 Oric was the name used by Tangerine Computer Systems for a series of home computers, including the original Oric-1 model, its successors the Oric Atmos, Oric Stratos/IQ164, and finally the Oric Telestrat. 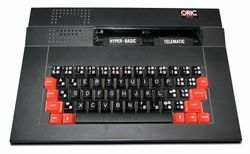 With the success of the Sinclair ZX Spectrum, Tangerine's backers had suggested a home computer and Tangerine formed Oric Products International Ltd to develop and release the Oric-1 in 1983 for UK and French markets. 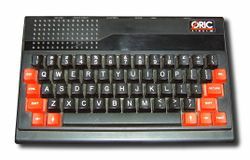 Further computers in the Oric range were released through to 1987 with Eastern European clones being produced into the 1990s. The first console, the Oric-1, was released in late 1983, but production was initially slow due to factory arson crime in the area. Based on a 1MHz 6502A CPU, the Oric-1 came in 16KB or 48KB RAM variants for £129 and £169 respectively, matching the models available for the popular ZX Spectrum and undercutting the price of the 48K Spectrum by a few pounds. Both Oric-1 versions had a 16KB ROM containing the operating system and a modified BASIC interpreter. During 1983, around 160,000 Oric-1s were sold in the UK, plus another 50,000 in France (where it was the year's top-selling machine). Although not quite the 350,000 predicted, this was enough for Oric International to be bought out and given sufficient funding for a successor model, the Atmos. Note: the 48K Oric machines are actually 64K machines. The top 16K of memory are masked by the BASIC ROM and thus normally not available for the user. The disc drive unit contains some additional hardware that allows it to enable or disable the ROM, effectively adding 16K of RAM to the machine. This additional memory is used by the system to store the Oric DOS software. The Edenspring money enabled Oric International to release the Oric Atmos, which added a true keyboard and an updated V1.1 ROM to the Oric-1. The faulty tape error checking routine was still there. Soon after the Atmos was released, the modem, printer and 3.5 -inch floppy disk drive originally promised for the Oric-1 were announced and released by the end of 1984. 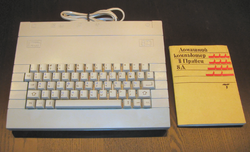 A short time after the release of the Atmos machine, a modification for the Oric-1 was issued and advertised in magazines and bulletin boards. This modification enabled the Oric-1 user to add a second rom (containing the Oric Atmos system) to a spare rom socket on the Oric-1 circuit board. Then, using a basic DPST (double pole single toggle) switch, the users could then switch between the new Oric Atmos rom and the original Oric-1 rom at their leisure. Although the Atmos had not turned round Oric International's fortunes, in February 1985, they announced several models including the Oric Stratos/IQ164. Despite their backers putting them into receivership the following day, Oric was bought by French company Eureka, which continued to produce the Stratos, followed by the Oric Telestrat in late 1986. In December 1987 after announcing the Telestrat 2, Oric International went into receivership for the second and final time. A Yugoslavian company (believed to be Avtotehna, based in Ljubljana) obtained a licence to make just 5000 machines. Machines were made, but whether they were under license or not is not known in any detail. Rumor has it that they assembled parts shipped from the United Kingdom. They were Atmos based, the only difference being the logo indicating Oric Nova 64 instead of Oric Atmos 48k. Nova had 64K of RAM, 16K of which was masked by the ROM at startup, leaving 48K to work with the BASIC language. A Bulgarian machine called the Pravetz 8D was produced between 1985 and 1991. The Pravetz is entirely hardware and software compatible with the Oric Atmos. The biggest change on the hardware side is the larger white case that hosts a comfortable mechanical keyboard and an integrated power supply. The BASIC ROM has been patched to host both a Western European and Cyrillic alphabet – the upper case character set produces Western European characters, while lower case gives Cyrillic letters. In order to ease the use of the two alphabets, the Pravetz 8D is fitted with a Caps Lock key. A Disk II compatible interface and a custom DOS, called DOS-8D, were created in 1987-1988 by Borislav Zahariev. This page was last edited on 19 August 2012, at 18:13. This page has been accessed 5,921 times.